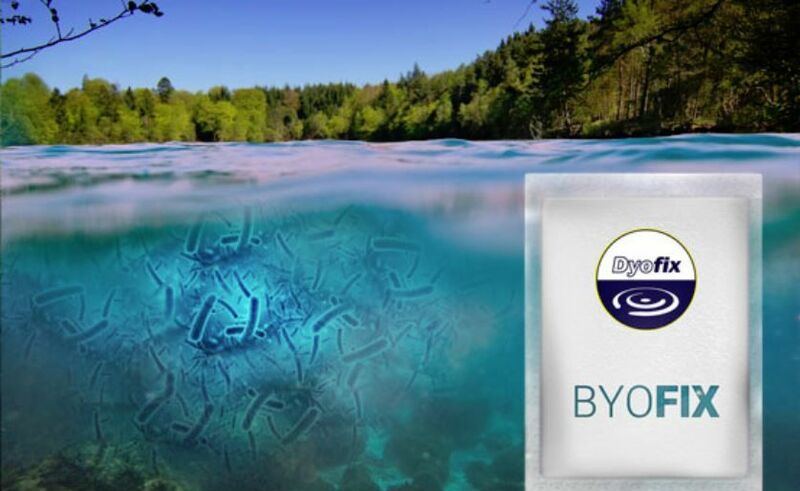 ByoFix beneficial bacteria has been specifically developed for large bodies of natural water to assist in the breakdown of nutrient and to improve the water quality in lakes and large ponds. The beneficial aerobic bacteria is completely harmless to fish and aquatic life but will rapidly breed within the water body once applied and will begin to digest rotting vegetation and organic matter which would, if left unmanaged, cause poor water quality, noxious smells and algae bloom. 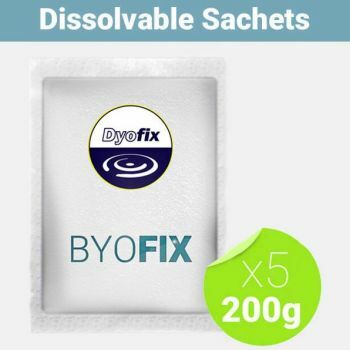 The ByoFix bacteria is very easy to apply due to the water-soluble sachets which can be thrown into areas within the lake body to evenly distribute to bacteria. 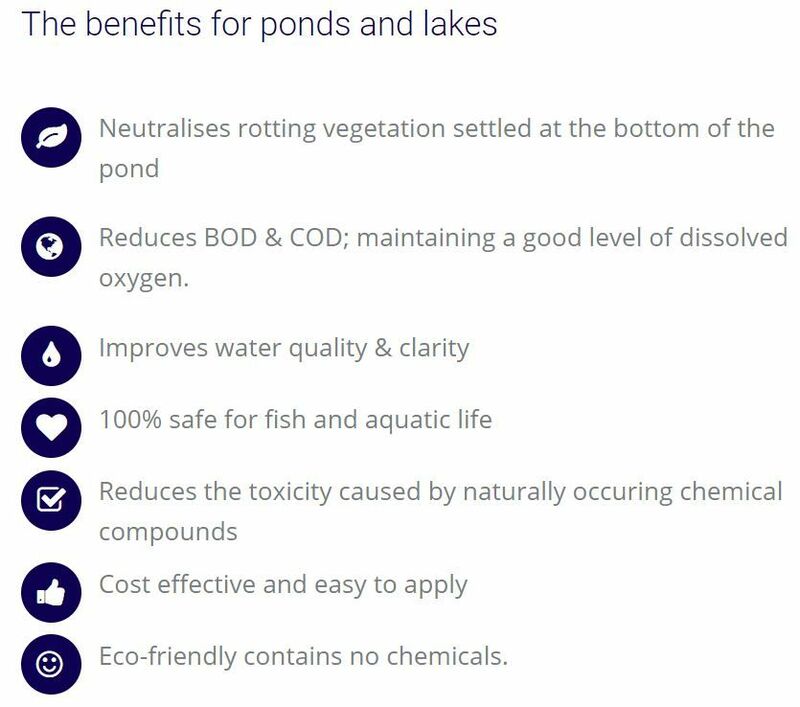 The aerobic bacteria cannot be overdosed but the use of Lake Aeration Equipment is highly recommended to support and increase oxygen content and circulation to maximise the effectiveness of the bacteria. 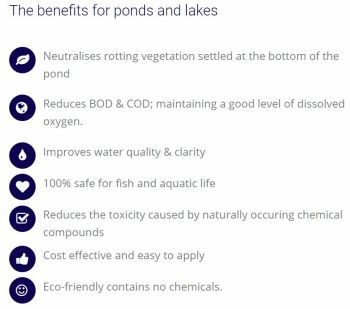 For initial dosing, Water Garden Ltd recommend applying 1Kg per 1000m² (1/4 Acre) of water surface area every 2 weeks until obvious signs of water quality improvement are seen. For maintenance dosing, apply 1Kg per 2000m² (1/2 Acre). As a general guide, apply a maintenance dose once per month but this will be conditional on sunlight levels and water temperature. 1Kg pack contains 5 x 200g water soluble sachets for easy application. Initial Dosing: 1Kg per 1000m² (1/4 Acre) of water surface area. Maintenance Dosing: 1Kg per 2000m² (1/2 Acre) of water surface area.